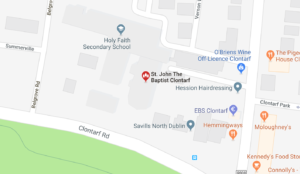 This group meets on selected Wednesdays from October through May at 7.30 pm , alternating between our own parish centre and the parish centre of the Church of Ireland, Seafield Road. Each meeting is led by Fr Martin Hogan and Rev. Lesley Robinson, Rector of Saint John the Baptist church, Seafield Road. Every so often, the parish organizes a series of faith reflection evenings. Parishioners are given the opportunity to reflect on some aspect of the rich heritage of our faith, drawing on the scriptures, Christian art and the life of the Church.